I always look for pork chops that are at least 1 1/2 inches thick and I always, always, always brine pork chops. The meat is tender and juicy. The only thing “tough” on pork chop night is the “seconds or dessert” decision. It doesn’t take much to brine pork chops, either. You need salt, water, and herbs/seasoning. And time. I usually brine pork chops overnight, or at the very latest, I’ll put the brine together after breakfast for dinner that night. I’ve made these pork chops for dinner four times in three weeks. Yep, four times. 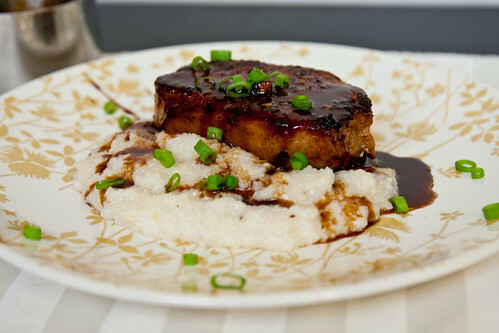 I serve the juicy and slightly spicy pork chops over a mound of grits – the sweet and sour (agrodolce) sauce soaks into the salty Parmesan grits. It’s pure harmony on a dinner plate. The Foodie Baby cannot get enough of those grits! I learned the first time that you need to make the sauce first – it has to cool pretty substantially before it thickens. Otherwise it’s pretty runny and not nearly as fun to eat. 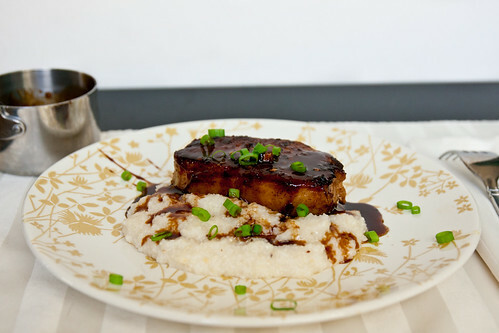 Juicy Pork Chops with a sweet and sour sauce. Add salt and molasses to water in a large non-metal bowl or enameled dutch oven, stirring until thoroughly mixed. Strip the leaves from the rosemary sprigs and roughly chop. Add sprigs and leaves to brine mixture. Add peppercorns and pork chops. 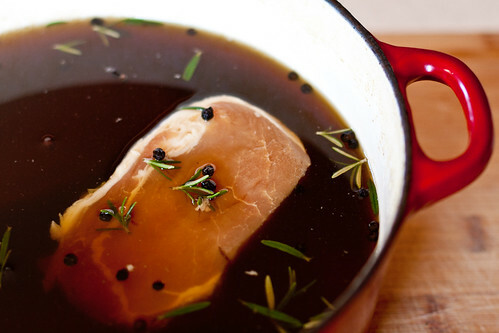 Remove from the brine and pat the pork chops dry before preparing. In a small sauce pan, stir together balsamic vinegar, honey, white and light green parts of the onions, and garlic over medium-high heat. Bring to a boil and let cook for ~10 minutes, reducing heat as necessary to prevent boil overs. Remove from heat, stir in butter until melted, and set aside to cool and thicken. Heat olive oil or cooking spray over medium-high heat in an oven-safe pan. Liberally season both sides of the pork chops with red pepper, salt, and black pepper. Sear for 3 minutes, flip pork chops, and finish in the oven to an internal temp of 150. Remove and let rest in the pan for 5 minutes. 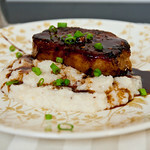 Serve over Parmesan and Truffle Butter Grits, topped with a generous spoonful of agrodolce sauce. Bring water to boil over high heat in a small sauce pan. Stir in grits, reduce to medium heat, and cover. Cook for 5 minutes. Stir in cheese and butter until melted. Season to taste. Serve hot/warm. This looks fantastic. Just starred it to make after the holidays. I LOVE pork. Wow this looks amazing! Will have to try it! I too, was in the “I don’t like pork chops” camp. In fact, my brothers were in it too. We grew up in a house where Mom always baked them til they were dry and very unappealing. Served with a side of microwaved lima beans the whole meal was the worst…. When my husband finally convinced me to try a chop that he’d pan fried it was amazing.. We’ve since taught my brothers the way of the pork chop- and are working on my mom so that my dad doesn’t have to continue to suffer! My husband is in the “too tough” camp too. I’ve never tried a brine. I’m gonna try this soon! My husband thought he didn’t like pork chops too, but it turned out that he just didn’t like the cheapo cut of pork chop (blade, I believe) that is tough. Wierd! Those are the best looking pork chops I’ve ever seen! Those pork chops are absolutely gorgeous! Can’t wait to make these for dinner tonight! Love agrodolce sauce! I made this tonight for dinner and it was awesome! Even my picky husband liked it! The sauce was his favorite. Guess what? I already had marked this as something to make NOW and then for Christmas, my sister gave me truffle butter! Without even knowing I could use it! Had this for dinner this week and it was absolutely FABULOUS! Already looking forward to making it again. Great job!! Thanks again so much for the recipe! Love your site!!! where is the recipe for the grits?? Right up there ^, in the recipe box. I made this earlier this week and it was delicious! Thanks for the great recipe!